• All subscriptions were due in March 2017. Please grab a renewal form from the web page hjs.org.nz/join or from the desk. Your continued support is very much appreciated. • With retirements we have Committee vacancies. If you are interested in joining us, please contact Simon at president@hjs.org.nz. 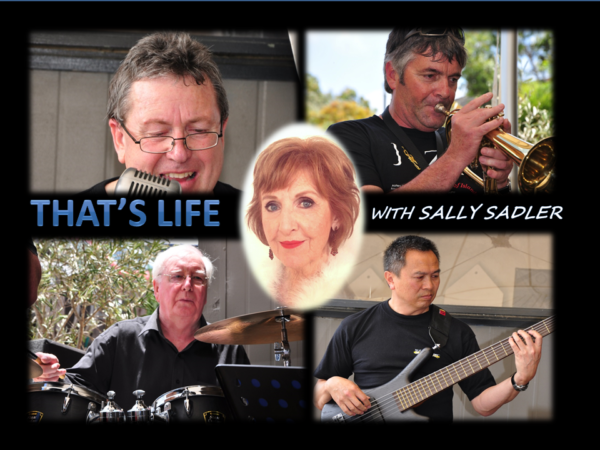 The Hamilton Jazz Society are pleased to welcome back That’s Life and Sally Sadler, from Auckland. This talented band has played with and accompanied a number of local jazz musicians in the Waikato / Bay of Plenty area, playing in bands like the BBC band, Jazz-a-Plenty, Dr Jaz, Georgian Jazz Gentleman to name a few. Jeff Smith heads up the band with vocals and keyboards, Gavin Law on trumpet and sax. Jimmy Gibbs provides the solid beat and rhythm on the drums, supported by Chris Sang on the six string bass and U-Bass. We also have very accomplished saxophonist Fred Baker sitting in with us for this gig. The band is delighted to have the support of the vibrant vocals of Sally Sadler. Sally has been singing around the Auckland area, and further afield for a long time and is one of only twelve NZ artistes awarded the ‘Shure Golden Microphone’ Award for Most Professional Performer. She was support-act for Tony Bennett when he visited NZ, has appeared in several early TV Shows as well as touring widely in Australia, workingClubs and RSL’s. Our supporting artist this month is Mark Taipari. Mark is an amazingly talented and experienced Kiwi musician. He has delivered classy and relaxed performances for literally hundreds functions over 30 years in the music industry. Mark is well known for his quality guitarmanship and vocals and we are looking forward to his relaxed style of blues and jazz.